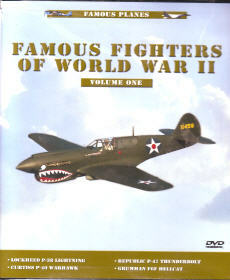 Famous Fighters of World War II, Vol. 1 DVD, Famous Planes Series - In this DVD, part of our continuing series of Famous Planes, we examine four Allied fighters, their history and development and the operational role they played during the World War II. Included in this DVD are profiles of the Lockheed P-38 ¨DLightning¡¬, the Curtiss P-40 ¨DWarhawk¡¬, the Republic P-47 ¨DThunderbolt¡¬, and the Grumman F6F ¨DHellcat¡¬.